Dashcam Viewer works with video files from Toguard CE20GPS. Just a heads up Dashcam viewer works well with the Thinkware F200 with front and rear camera plus GPS data. This is by far the best dash cam viewer I have found and am liking it very much so far. One wish I have would be able to generate videos that also include the Map and other graph windows like in the Youtube preview videos. The only way I have found to do this is by doing a screen record but would be great if the app could do it automatically. Am I missing an option or is it not possible? I appreciate the excellent feedback and suggestion, Al. Currently screen recording is the only way to do this. The best tool for dash camera footage viewing. One questions I have, Check for New Version does not do anything noticeable. Nothing opens in any of my browsers in Win 10. I have to manually go to your site to download. Any advice? Sounds like an issue with the Windows version. I will make a note to check it out. Thanks! I can only recommend the software. Thumbs up! I like software that simply does what I want it to do, and Dashcam Viewer does exactly this: A great tool to view and merge the video clips, remove the overlap and display the additional information like speed and GPS – and that all for a fair price. I use it with a Street Guardian SG9665GC V3 on a Mac mainly to combine the videos of my road trips, and works fine. HI, I’ve installed an Audi Universal Traffic Cam. It has front and rear cameras, GPS, etc but no viewer software. Will you be adding thei to your excellent programe anytime in the future……..please !! Hi Peter, please see the FAQ, question #1. Thanks! Thanks John, I’ve sent files as suggested. May thanks for your help. Hi John, I was wondering if you had any updates on support for the Audi Universal Traffic Recorder I have installed. You may remember I sent you a dupe of my SD card back in May. I’ve examined the files produced by the Audi Universal Traffic Recorder and the manufacturer combined both A and B video channels into a single movie file. Unfortunately, Dashcam Viewer’s video library does not support videos encoded this way (the two channels need to be separate). Any plans to support Rexing dashcams? A Rexing user provided movie file data to me and I was able to locate the GPS data in the file. Unfortunately, the GPS data is encoded in an unknown format. That user contacted Rexing. Rexing said they would get back to him after the Lunar holiday, but they never did. So unfortunately we are stuck without the decoding scheme for the data format. Anyone here tried YI dashcam? do you think dashcam viewer android version? Sorry, an Android version is not planned at this time. Hey, I think I first saw your software in the Techmoan video. After using it for couple of months I decided to buy it. I really like it, keep up the great work! Impressive. Kudos. Sold. (Haven’t even taken delivery of my dash cam yet). John – Do you have any suggestions or point me towards any resources where I can learn how to take my combined dashcam video files and speed them up outside of the viewer software? Thank you. There are a number of options to do accelerated playback rendering, but I prefer GoPro Studio because it has an intuitive user interface. Thanks John. Is there some trick to converting the Dashcam video files so the GoPro Software will recognize them and import? I’m using the Falcon Zero Dashcam and it records in the .mov format. Or do I have to use another accelerator program? Thanks again! I have had a look at the above software and like what I see but upon trying it I find that I get a ‘black screen’ and no video but all the other items including voice is present and correct but before purchasing the software I would like to get a resolution. I have checked out your FAQ and can see that this is an issue but what confuses me is the software worked on my previous PC running Win10 but not this new PC. My Dashcam is a Street Guardian SG9665GC – 32GB card and has a resolution of 1080. What other info do I need to provide you with to help me out. However after doing the above, but not connected, I received a message telling me there were Driver updates available for the Video card, which I installed. So in reality I was not to sure which of the two sorted the problem so I reset the ‘Video Player’ to the MS default which is “Windows Media Player” and it failed to provide any video pictures so I changed it back to VLC and hey ho it is now A1 Okay. So I will give the software a go and no doubt purchase a license. 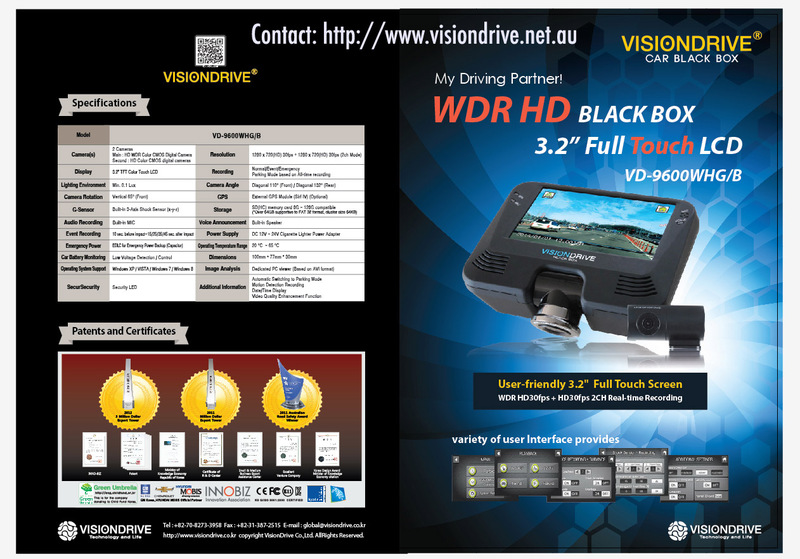 Does it take .vd files from VisionDrive VD-8000HD? I can’t find a way to open them. Thanks! Sorry, Grigori, I am not familiar with that dashcam or with .vd files. Doesn’t sound like a standard movie format. Best John, is there something you can do for the vivio A119 1080p so we can use the higher resolution? its a shame we cant use that. John: Do you think there will be a day when I can run my files off an external drive instead of having to transfer to the PC the software is running on? Thanks! Can i use it in blackvue 650 dash cam? Yes, it should work with the 650. Hi John, there is any ability to changes the icons like the car in the middle of the wind rose. I use the dashcam on motorcycle so having a car in the middle of the wind rose its a bit strange. There is also a way to keep all feature in a main window and not to have to use the toogle “synch windows movement”. I just tried it and it worked for me. You can try the alternative method and see if it works: click on the graph and use the “1” and “2” keys on the keyboard to lower and raise the max speed. The motorcycle icon is a good idea, Pascal. I’ll add to my ToDo list. Sorry, but the sync window movement is the best way to preserve the orientation of all the windows. You may well know this already but I’ve just seen that it is possible the Nextbase 402g is a rebadged version of the DOD LS430w. The only reason I’m posting this is that I see you have another DOD camera working with your software and wonder if you have had better assistance with the DOD people than with Nextbase. Sadly, no. See the FAQ, question #6. Greetings, https://www.youtube.com/watch?v=J-c5D–YvrE for those that enjoy the restrictive software provided by nextbase for the 402G they might also find a striking similarity to the DOD video player shown in that you tube video. I was rather distressed to find the attractive pink line on the map that showed the route travelled on any segment played with the driving recorder player has evaporated. I would gladly entertain any suggestions as how to lure it back. Just another reason that I would very happily move from the feature impoverished nextbase/DOD driving recorder player to the continually evolving, improving Dashcam Viewer. Doug, we all know how frustrating this is and now my 402G battery is giving up the ghost after just 16 months. To be fair they are sending me a replacement. If I’m not successful fitting the new battery to my device I’m off to buy one of the models John lists in his compatible list. I’ve contacted Nextbase a few times about their software but to date no positive response. Greetings, 16 months isn’t in my experience bad. The original battery in mine failed within a year. I contacted nextbase & they quite happily replaced the battery & did a firmware upgrade. This battery lasted about 6 months & they subsequently sent me a new one which I fitted but this sadly only lasted about 6 months. Rather than going back to nextbase I am trying to find a suitable replacement myself in the hope that its better quality. Good luck with new battery. John – Love the software. Question: When I export a KML file to Google Earth, the file names appear on Google Earth’s map interface. Is there a way to export the KML without the file names. I’m just looking for the route to populate, nothing else. Thank you. Todd–there’s no way to do that currently in DV but you could use a text editor to find and delete all lines in the file. Are you planning to add support for 1440p in A119? Still not there in 2.6.6, and I’ve paid for a program that I can’t use. Hi John, this is very puzzling and frustrating, and there doesn’t seem to be any way to resolve the apparent discrepancy between users’ experiences. My current approach is to use NovaTrakt to extract the GPS data for RegistratorViewer. I appreciate your kind offer of a refund but, as I bought it 3 years ago for use with an earlier camera, I won’t pursue that issue. I’d certainly like to hear from anyone who has had the problem and found a way to fix it. 1) old Vehicle placemark icon is better than the new dot..at least give an option to choose. 2)give an option to open two map windows to see map at different zoom levels simultaneously. Good suggestions. Can’t promise they will be incorporated soon but I will add them to the ToDo list. Your software is awesome and the video playback of my Viofo A119 works in 1440p. Thanks, Darkside! BTW, are you on Mac or PC? I am on a PC using Windows 10. As Nextbase are advertising on British TV with the programme ‘Car crash, Britain’ its a shame that they don’t listen to customers and make their software compatible with DashCam Viewer. Some customers are considering changing to devices like this Viofo A119 which sounds extremely good. Thanks DaRkS!De for telling us about it. I’m green with envy and hopeful that you are using a PC. Well, I love the look of the interface, and there is certainly a lack of decent dashcam viewing software available, the Mio software doesn’t even support 2ch for their 2ch camera. Sad to say that I can’t get any video to play with DashCam Viewer.. I have both the Mio MiVue 698 Dual and the Mio MiVue 388 (in wife’s car) and even despite the 388 being listed as compatible, no video will play. GPS track info is read fine, the maps are accurate and the speed etc shows, but only statically as I click along the timeline speed graph as the video screen remains black and doesn’t play the video. I’ve tried it on my main PC, an i7 with an nVidia GTX980Ti running win 10, my server a Dell running server 2012 R2 and my Surface 3 running win 10, and its the same on all of them, everything looks right, but no video playback for either camera. My next step is to grab a Macbook pro from work and try it on that. Update on this post, I have now tried it on the Mac version and it works great with the MiVue 698 Dual.. but of course there is no 2ch support yet, plus, I don’t actually own a Mac.. but it did play video fine, even in super HD from the front camera. Yes, the 6xx series movies only seem to play in the Mac version of Dashcam Viewer. I think it’s related to an incompatibility with the codec and Microsoft DirectShow libraries. Robert, a few of the dash cam movies I’ve tested play on either Mac or Windows, but not both. In the cases where this occurs I’ve pointed it out on the DV homepage (e.g., MiVue 580 and 658 are Mac DV only). But perhaps I’ve missed some cases. I will have to go back and see if my sample 388 movies play on my PC. (Edit: You could try adding a codec pack and see if this helps. http://shark007.net or search for K-Lite pack). Those of us with Nextbase dashcams continue to be disappointed by their attitude to your software. So much so that as my missus has grown to like our dashcam I now have permission to research a new one. Obviously it will not be a Nextbase while I cannot use Dashcam Viewer with it. I warned them some time ago but presumably while their sales are OK they aren’t interested. While I am happy with the NextBase image quality, I too am fed up with the NextBase software. I have tried to get the GPS coding from the as well with no luck. I am also looking for a different brand camera. I love the Dashcam Viewer and the willingness John to listen to his users. I would like to know what other cameras are out there that give high quality image & performance. That makes (at least) 3 of us. With my NextBase 512G relegated to the back seat I’m in the market for a new dashcam. One of the requirements for any new kit is that it offers seamless compatibility with all the many features of “Dashcam Viewer” – and that puts NextBase out of the frame. Sorry NexBase but you’re being overtaken by an increasingly competitive market. Guys, don’t relegate your NextBase dashcams to the closet just yet! I can’t go into details but there’s been some progress made in the NextBase decoding by a 3rd party. I’m hopeful at least the 512G will be supported in the near future. Stay tuned. Thank you John – as ever, on the case! Perhaps I should have said back shelf rather than back seat… that’s the dog’s domain. It’s a new forward facing camera that I will be getting, this time making sure beforehand that it offers full compatibility with your viewer. but as Brian says, John, you are keeping a constant track on what your customers or potential customers are saying which is unusual and excellent in this day and age. Rather sad reflection on Nextbase (I have a 502G (the g probably for Gopping software)) that this forum has become a centre of gripes about the crappy nextbase software. I am hoping given the lethargy shown by nextbase that the 512 & 502 will probably use the same code and thus save me the expense of replacing it (at least until it dies of natural causes). I was informed bryn@nextbase.co.uk (head of Marketing Tel 0203 195 0868) “We are however looking at a number of alternatives to bring more features to our player in the near future.” that was on 5/5/2016, sadly beyond my ability to hold my breath. Personally I think that the ability to be able to use the data harvested by the camera is 50% of the reason to have one. Nextbase amongst others could learn a great deal by looking at the way Dashcam Viewer is conducted. Well put, Doug. I echo your frustration. I’ve also reached out to NextBase and got the same result. That said, with the help of a 3rd party I hope to have a solution for the 512G soon. Brian, could you please send me a few 512G sample movies via https://wetransfer.com? 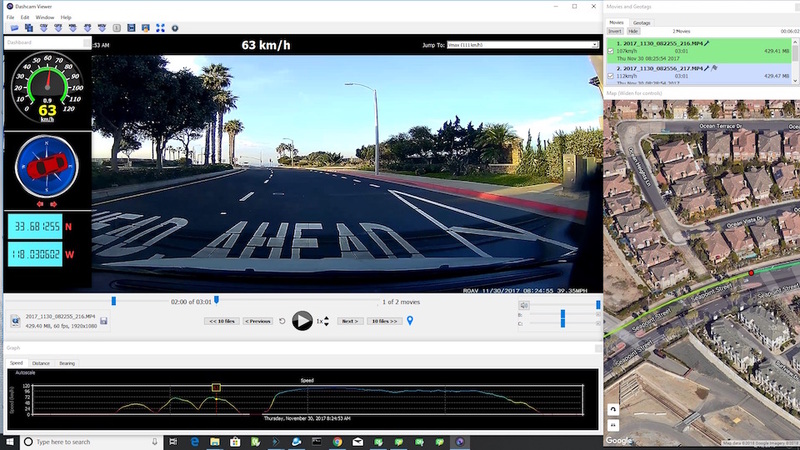 I’ve got preliminary 512G compatibility in Dashcam Viewer now, but I need more samples to verify it’s working correctly. John, if I sent you a couple of Nextbase 402G files would it be possible to see if they work on your software? I know that’s really saucy of me but – yep, that’s me, a real creep. Just wish I’d spent that extra few bob on the 512G. Yes, that would be super, Mike. Three sequential files should do it. Use https://wetransfer.com. Thanks! Good news– Dashcam Viewer 2.6.5 has 512G compatibility. Plus 302G compatibility in the Window version. Please download it and give it a try. Thanks for the samples, Brian. Also, special thanks to Brian K for his help with the 512G. Will you working to support Cobra CDR 850 on Mac also? Do you need sample, or how can I help you with this issue? I have HP f310 & f800x and am pleased with both. Is Dashcam Viewer compatible with EBORN HD Dash Cam with Built in GPS ,170° Angle View,1080P 1296P,32GB Card included,Car Dashboard Camera Recorder DVR with 2.7 inch LCD, Parking Monitor ? Is Dashcam Viewer licence in perpetuity or annual subscription? Hi John, I’m not familiar with that dashcam model. Please see FAQ, question #1. 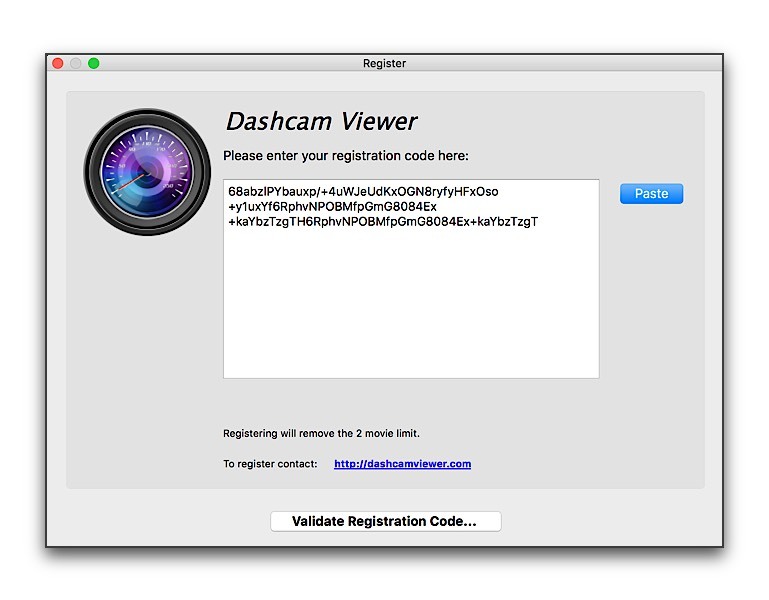 Is Dashcam Viewer license in perpetuity or annual subscription? Good question. The license has been “in perpetuity” since day 1. Dashcam Viewer customers have had free updates since version 1.0 came out in 2014. I have no plans to change that but I can’t guarantee that the licensing scheme will never change. HP f800x, HP F210, HP F310 , HP F520G (Mac version) ?? Is Windows version compatible with these cameras? The movies from all of those HP dashcam models play correctly on the Mac version. Unfortunately, they do not play on the Windows version. I think there is some sort of codec incompatibility with the video backend used in Windows Dashcam Viewer. Sorry about that. I still don’t see the ‘ability’ to switch between front and rear cameras? Yes, this feature will be in version 2.6.1. Thanks for your patience, Mick!